Okay, so as promised, this is the past fortnight of photos. I know there aren’t many, but I’ve been a busy girl and a lot of the outfits were work uniform which is all black. So I just chose the ones that I thought were worth showing, and forgive me, I couldn’t for the life of me remember which days were which when it came to uploading, so rather than order them by day, I have simple numbered them. 1. 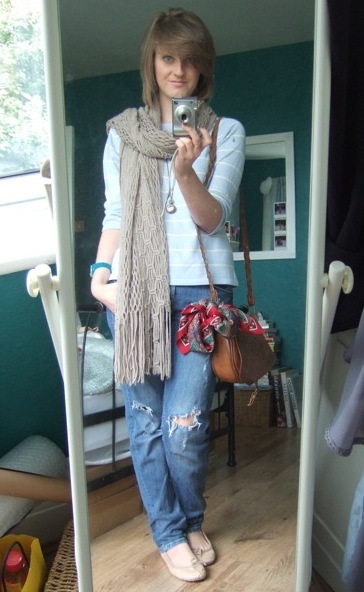 Stripe jumper – Charity Shop, Scarf – George @ ASDA, Jeans – Topshop, Pumps – Topshop, Bag – Primark, Scarf (tied to bag) – Charity Shop, Necklace – Love Suzie. 2. 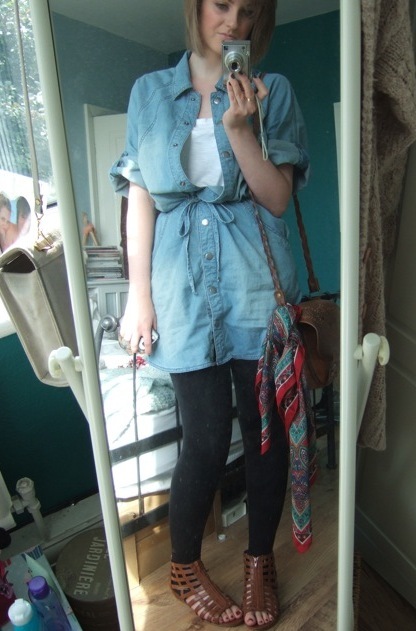 Denim dress – Warehouse, Leggings – Topshop, T Shirt – Dorothy Perkins, Bag – Primark, Scarf (tied to bag) – Charity Shop, Sandals – Dorothy Perkins. 3. 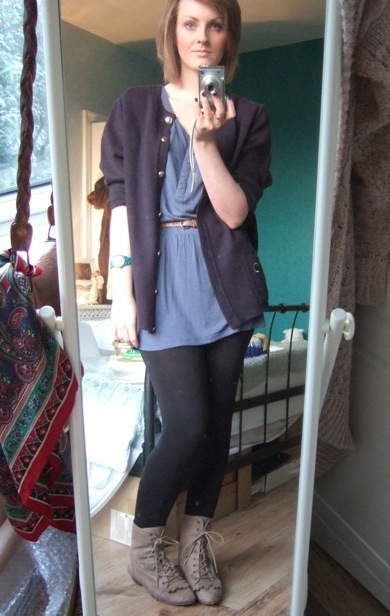 Cardigan – Charity Shop, Jersey Dress – Warehouse, Woven Belt – Primark, Leggings – Topshop, Boots – Topshop. 4. Owl Tunic – Topshop, Leggings – Topshop, Sandals – Dorothy Perkins. 5. 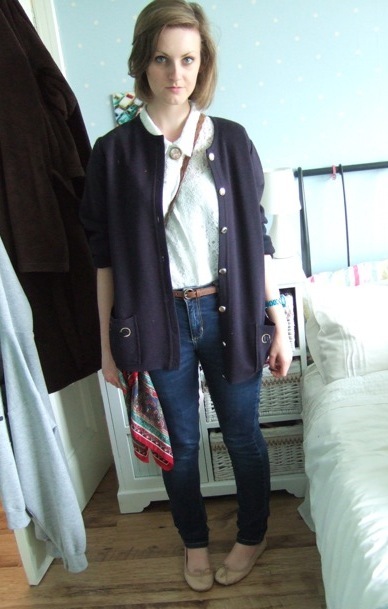 Cardigan – Charity Shop, Blouse – Charity Shop, Jeans – Topshop @ Ebay, Brooch – Charity Shop, Woven Belt – Primark, Pumps – Topshop, Bag & Scarf – as before. 6. Knitted T shirt – Charity Shop, Jeans – Topshop @ Ebay, Pumps – Topshop, Tapestry Bag – Charity Shop. I’ve just noticed that I seem to be wearing a lot of blue lately, I hadn’t realised! Hope you like the outfits, sorry again there was a delay!